I posted this to G+, but I find those posts difficult to track down later - so here's the blog version of the review. The FAVI SmartStick I got for myself for Christmas has tested well, and I think it's worth it to get more for family and friends. It's a simple device: a $50 Android tablet built into a dongle about 10cm x 3cm x 1cm. It plugs directly into your TV's HDMI port, and lets you run pretty much any android app through your TV. I got it with the FAVI wireless keyboard (I'll just call it the 'keyboard' from this point). I'm watching Netflix on my father in law's big TV right now. The picture is pretty good. (Captain America is streaming over wifi with no hitches). Addendum 2013-01-01: Now that I'm home from the in-laws, I have hooked the SmartStick up to my own network and 7 year old TV. The experience is still good, and the problems are mostly the same. You'll find more addendums in italics, below. The physical connections were easy. Getting the keyboard to pair with the stick was easy too. Unfortunately, the pairing is not particularly reliable, and the SmartStick is very laggy, so it was hard to get the setup to work. 2013-01-01: Once I put the dongle on a USB extender to get line-of-sight from the couch to the sensor, life got a lot better. So far it's quite reliable up to about 5m (16'). The SmartStick did let me install Google+ and Netflix, and comes with apps like Plex preinstalled. It took some time for the Play store to load - not surprising on a $50 bit of hardware - but the play store did load and did work. Addendum 2013-01-01: I tried using various launchers to see if I could get a better experience than the default launcher. After a week of fiddling around, I'm back to the default. It took quite a bit of fiddling to get the SmartStick to recognize the WPA2 secured home network. It really shouldn't have been this hard. It appears that the SmartStick couldn't figure out how to talk to the network when running the setup program. Eventually, I did a 'manual' setup by going through the settings and entering the network information. 2013-01-01: No trouble getting on my home network through the normal android settings. It took some time to figure out most of the controls for the keyboard, and I still haven't got the standard IR remote to do anything. Netflix is running smoothly, though, with only one little hitch so far. 2013-01-01: The IR sensor is no longer part of my setup at all. The only function that I was using the remote for was the off button - and I can do that on the keyboard with 'FN+CTRL-ALT-DEL'. I'd like the onscreen keyboard to stop popping up, though. The range on the keyboard is shorter than I'd like. This house has a big living room, so I find myself getting up and standing next to the TV to make it work. 2013-01-01: As noted above - in a smaller room, and with line of sight, the remote is working great. 2013-01-01: I have an old XP machine behind the TV, and run PLEX on it. The FAVI connected to it easily, and browses the content well. I haven't figured out how to increase the image quality yet from "2MB / Quality 6" - but I'm sure I'll be able to. 1. Sit where you normally sit to watch TV. 2. Hold your phone a comfortable distance from your face. 3. 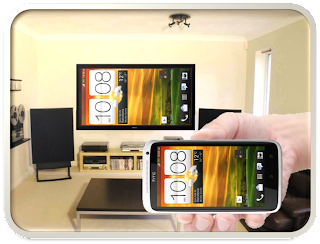 Keeping the distance from eye-to-phone constant, hold the phone beside the TV. 4. Note the apparent screen size for both screens. 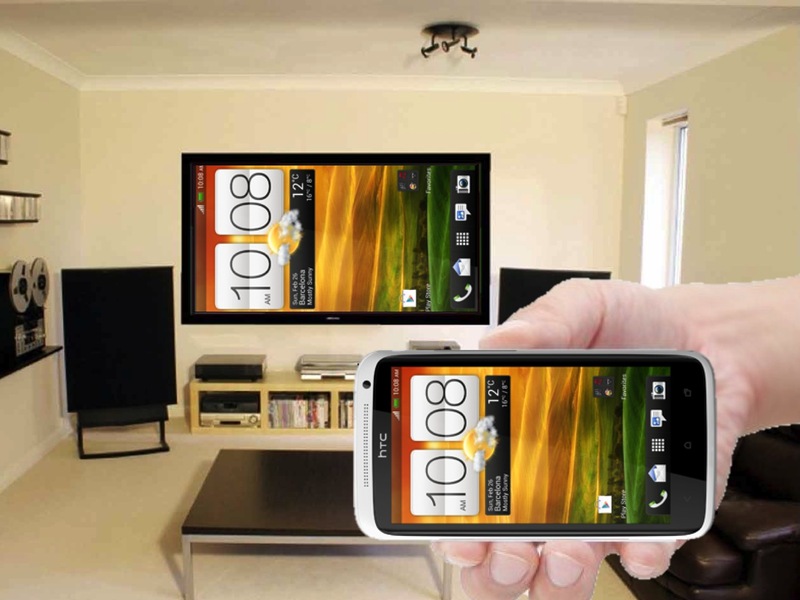 For many of us, the relative size is similar - but even though the relative size of the screens is about the same, the distance plays a factor. The TV has no touch interface, so anything that requires scrolling, gestures or paging is not great, while apps that are mostly select-and-view (netflix, plex, youtube) work really well. If you touch to activate, it'll be fine. If you drag or swipe to activate, not so much. I gave up on most widgets pretty quickly for this reason. I have really good retinas, and bad lenses. I can read tiny text on a high-resolution phone with ease (I have an HTC One X and a Nexus 7) and can see the pixels on a retina iPad at 30 cm. Being nearsighted also means that even with great glasses or contacts I can't quite make out the same small text on the more distant TV. Sure, you can update the android settings to have large or huge text - but a lot of applications don't handle that very gracefully. I'll be buying at least one three more of these. The old XP "media centre" I have lodged behind our TV at home is going to be replaced: it's going to be a Plex server soon, and I'll run all the video I want through the SmartStick. At $50, this is a great deal. I think I follow your example of screen size comparison, but I'm not sure. A picture or diagram would have helped me here. Good idea. I'll scribble something up and add it.